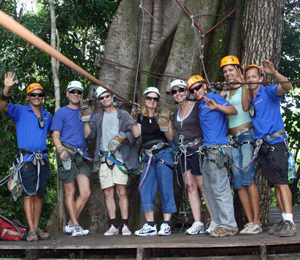 My family and I had the time of our lives on your ziplining tours! It was one of the best moments of our vacation... truly unforgettable! We would recommend this to all of friends! Even our little ones were daring enough to get up on the ziplines and they absolutely loved it! Cabo zip lining was amazing!!!! You were literally going from one mountain cliff to the next! It was so cool. If you are going to Cabo San Lucas, try these zip line tours! We all had so much fun! It's really one of the most exciting and heart pounding rides we've ever been on. Your feet are hanging hundreds of feet over the ground! What a rush! Had a blast with the whole family on the Canyon Canopy Zipline Adventure. Cabo San Lucas was everything we thought it would be, but we did not expect ziplining to be such an amazing experience. It is thrilling but awe inspiring too, with some of the most amazing vistas we saw on our entire trip.